It’s Christmas Time at the Excelsior Hotel Malta! This entry was posted in Christmas in Malta, Excelsior Hotel Malta, Festive Season Dining on December 22, 2010 by admin. Last week a number of volunteers forming part of the Aid the Community Committee of the Grand Hotel Excelsior, took time out of their busy work day to have tea with the residents and carers of Dar il-Wens in Kalkara. Aid the Community is one of the committees set up by the HR Department of the Excelsior Hotel Malta to assist the less fortunate. The group of volunteers was warmly welcomed by all at Dar il-Wens. The Grand Hotel Excelsior team makes every effort to assist those in need – be it employees or the members of the community. This entry was posted in Excelsior Hotel Malta on December 22, 2010 by admin. 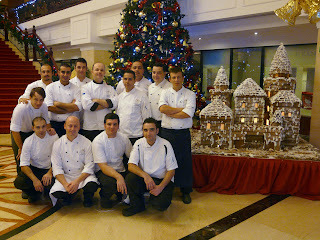 Meet the Gingerbread Family at the Grand Hotel Excelsior! VALLETTA, MALTA, December 2010 – Nothing beats the smell of gingerbread in the air at Christmas time! Bring your kids to the Grand Hotel Excelsior to create some magical memories! A number of chefs from the Excelsior’s award winning kitchen brigade took time out of their personal schedule to work on this year’s Gingerbread Castle. A large number of hours were put into creating this spectacular 114 kilogram house, which proves to be an attraction year after year. The Excelsior chefs have prepared something a little more special for you this Christmas. They are not only teasing you with the gorgeous aroma of gingerbread as soon as you walk in to the hotel lobby, but also giving you the chance to taste these hand-made delights. Enjoy a relaxing afternoon on the cosy sofas of the Harbour View Lounge, sipping on mulled wine and nibbling on Christmas treats, to include mini mince pies, traditional festive fruit cake and ginger bread biscuits for just 2.50 Euro per person. Keeping the little ones in mind, after all Christmas is for kids, the Excelsior Hotel Malta has put together innovative stocking fillers – the Gingerbread family is available to purchase from Harbour View Lounge. Contact the Grand Hotel Excelsior on 21 25 05 20 or food.beverage@excelsior.com.mt for more information or visit http://www.excelsior.com.mt/. Live the Grand Life this Festive Season. 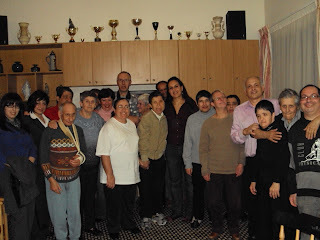 This entry was posted in Christmas in Malta, Luxury Malta Hotel, Malta Events, Things to do in Malta on December 21, 2010 by admin.